Our first print issue is here! Printed, delivered, unpacked and neatly-piled. The journal includes fourteen pieces of creative non-fiction, poetry and visual work, produced by researchers in London. And it desperately wants to be read by you. 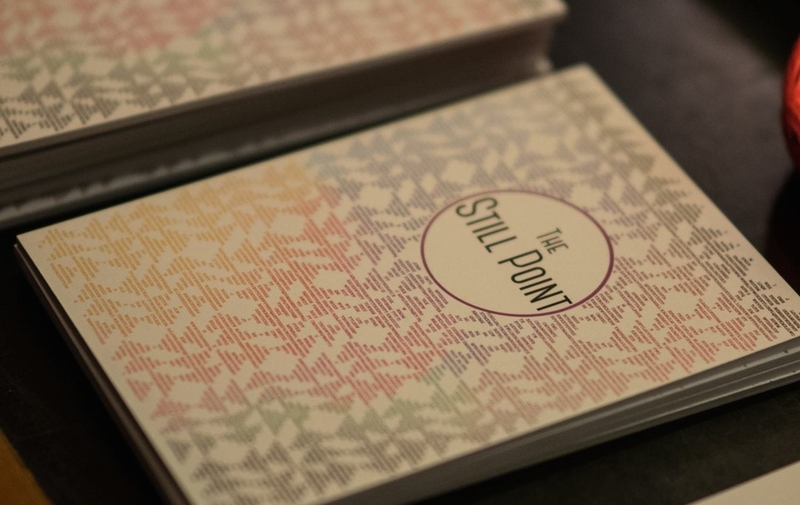 You can request a copy by emailing editor@thestillpointjournal.com. We’d love to know more about our readers, so please let us know how you heard about us and if you are involved in any research yourself. The journal is available at no cost, thanks to generous support from the London Arts & Humanities Partnership and the AHRC. We have limited copies, so make sure you don’t miss out! We will be distributing copies at special locations and events around London over the next few months. So keep your eyes peeled and your ear to the ground. Follow us on twitter @stillpointLDN or Facebook for clues. You can also read Issue #1 online from cover to virtual cover. A year ago The Still Point editorial team came together for the first time to discuss our vision for a new literary journal for Arts & Humanities researchers in London. We were just beginning our PhDs and, floundering in both the uncertainty and rich possibility of our research projects, we decided we wanted to publish a journal which reflected this experience of being new researchers. For us, ‘the still point’ represents those moments when we take time out of our day for deep thinking and reflection. The pieces in the journal, free of footnotes or bibliographies, should feel more like a collection of conversations had with fellow researchers over coffee than academic papers. The journal, then, is a space for storytelling about the research process. This first issue is an experiment in the many different ways we can write about our research; we hope that this is just the beginning. Despite the openness of our call for submissions we found that there were a number of themes threading their way through the material we received. Issue #1 begins and ends with researchers listening to voices from the past, but audioception (hearing) is just one of the many senses invoked by our contributors. From the sensory-overload of flicking through a book; to the intense, sensational quality of memory; or even the vivid sights and smells of the Moscow Library Canteen; all this, and more, makes Issue #1 a veritable feast for the senses. Language is also a sensory experience; for many of our contributors – either writing English as a second language, or testing out other tongues – language has the power to make the world feel different. Mina Ray’s multilingual poem (in which English, Croatian and French each form another layer in the linguistic palimpsest) is the centrepiece of a journal which moves, reflectively and imaginatively, between languages. At The Still Point we believe in the printed object and the practice of slow-reading. The journal has been designed to attract your attention and to keep it: get to know the feel of the pages, explore the visual riches of the illustrations, and maybe even try the words aloud. Whatever you do, make sure you enjoy it. Editorial Team: Thalia Allington-Wood, James Fisher, Sinead Kennedy Krebs, Amy Lidster, James Morland, Ellen Pilsworth, Charlotte Rudman, Christopher Webb and Briony Wickes.